Hi everyone!! I am so happy to show you the Cafe collection from The Nail Junkie!! Coffee is a deep brown with a gorgeous subtle shimmer. The formula was perfectly smooth and easy to apply. I absolutely adore this color. The shimmer has such an amazing effect! Shown is three coats of Coffee. Tea is a burnt orange shimmer. The formula was easy to apply, but does show the brush strokes a bit strongly. This is a great shade for fall, isn't it?! Shown is three coats of Tea. Cocoa is a soft bronze shimmer. The formula was easy to apply, and went on very smoothly. I really like how this is strong but delicate at the same time! Shown is three coats of Cocoa. 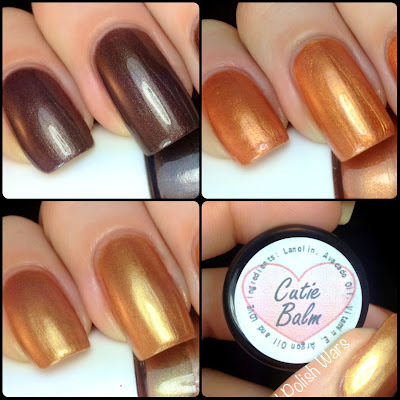 I also had a chance to try out The Nail Junkie's awesome Cutie Balm! It's a wonderful and soothing cuticle balm! I love it!! You can find The Nail Junkie at their store here, and be sure to check them out on Facebook for all their updates. I love this post! Thank you for sharing Nicole!!! 1 Year Blog-iversary - Thank you! !